Institute for Innovation and Economic Development in the press. What do surfboards made from shrimp shells, organic cold-pressed juice and an ag-tech mobile app for farm management have in common? They’re all products made by winners of Startup Challenge Monterey Bay, an annual competition for entrepreneurs sponsored by the Institute for Innovation and Economic Development (iiED) at Cal State Monterey Bay’s College of Business (COB). More importantly, the entrepreneurs and their businesses are now part of a thriving “economic ecosystem” in Santa Cruz, Monterey and San Benito counties. 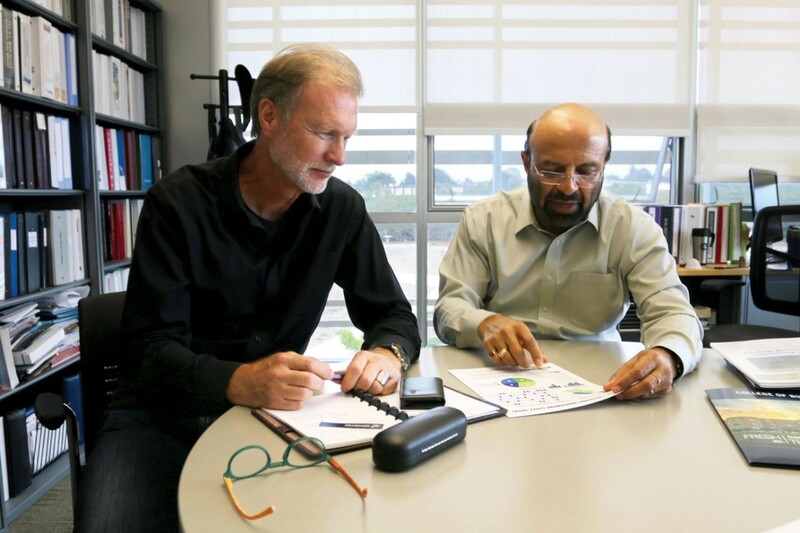 Brad Barbeau and Shyam Kamath discuss the iiED’s impact on the region’s entrepreneurs. Central Coast entrepreneurs face off again this spring for a share of $50,000 in prize money at the annual Startup Challenge Monterey Bay sponsored by the College of Business’s Institute for Innovation and Economic Development (iiED). The Challenge offers four divisions of competition: Venture for businesses that intend to scale into large enterprises and can provide venture-capital level returns to investors; Main Street for small businesses, sole proprietorships, and non-profits; Student for middle through graduate school students; and Social Venture, a new division added this year for businesses with a social mission. Past winners Cruz Foam, Katie’s Coldpress and HeavyConnect are standouts flourishing in the region. Monterey Bay magazine recently checked in with the businesses to find out their latest news and to ask them how the Startup Challenge impacted their entrepreneurial journeys. Applications are due by midnight, Monday, March 11th for the 2019 Startup Challenge Monterey Bay. Entrepreneurs and startup companies in Monterey, Santa Cruz, and San Benito counties should apply to the competition at https://startupmontereybay.com/. Startup Challenge Monterey Bay is a new business competition and accelerator program that supports the founding, funding, and growth of new and innovative businesses in the Monterey Bay region. It offers workshops, feedback, and mentoring to empower entrepreneurs in a competitive process. Nothing inspires and prepares entrepreneurs to bring their ideas to market like Startup Challenge Monterey Bay! This year the competition has four divisions: the Venture Division for businesses designed to grow into large businesses; the Main Street Division for small businesses and sole proprietorships; the Student Division for student teams at all levels from high school through graduate school; and a new Social Venture Division for non-profit and for-profit businesses with a social mission. It is free to apply. Prizes offered by the Challenge include $1,500 cash for the winning Student Division team, $10,000 cash and professional services for both the winning Main Street company and Social Venture, and a $20,000 grand prize in cash and professional services for the winning Venture Division company. Key dates for the Challenge are the application deadline on March 11th, the Qualifying Round pitches on April 6th, and the Final Round and Venture Showcase on May 10th. The Challenge is open to all entrepreneurs in Monterey, Santa Cruz, and San Benito counties. Applications are to be completed online at https://startupmontereybay.com/, and are due March 11th. Startup Challenge is a community service organized by the Institute for Innovation and Economic Development (iiED) at California State University Monterey Bay (CSUMB). The iiED, an institute of the College of Business at CSUMB, offers programs that work toward developing entrepreneurs and supporting innovative ideas that lead to new business opportunities and job growth for both students and community members. offered by the Challenge include $1,500 cash for the winning Student Division team, $10,000 cash and professional services for both the winning Main Street company and Social Venture, and a $20,000 grand prize in cash and professional services for the winning Venture Division company. Startup Challenge is a community service organized by the Institute for Innovation and Economic Development (iiED) at California State University Monterey Bay (CSUMB). The iiED, an institute of the College of Business at CSUMB, offers programs that work toward developing entrepreneurs and supporting innovative ideas that lead to new business opportunities and job growth for both students and community members. Monterey is catching up with the rest of the telecommuting world. The area’s first coworking space launched late last year, bringing the latest trend in space and idea sharing work communities to the area. The enterprise is called Hellodesk and was co-founded by Pacific Grove startup entrepreneurs Avneesh Kumar, 39, and Sam Hain, 44. Please visit the Monterey Herald here to view the original article. SEASIDE, Calif. – Hundreds gathered in Seaside on Friday for the 2017 New Frontiers Water Forum. The all day event was sold out and brought water experts, researchers and innovators from all over the World. The goal of the conference was to find new ways to conserve and manage water on the Central Coast. The Central Coast faces challenges that other parts of California do not when it comes to sourcing water. There is no Hetch Hetchy Reservoir or Colorado River pumping water into the Central Coast, for the most part it is sourced locally. Sedlak says even though the drought is over, it is not a matter of if there will be another drought, it’s a matter of when. He also says one of the biggest challenges is having residents live within their means. “In a wet year there might be plenty of water but in a dry year we draw upon our ground water supply and start depleting it and we have to do a good job managing the needs of people and farming to make sure that we have enough water to get us through the drought periods.” says Sedlak. Although the desalination plant is being discussed, water management officials say they will take a closer look at recycling water and storm water collection first. SEASIDE, Ca., March 1, 2018 – California State University, Monterey Bay (CSUMB) is set to host the Startup Challenge again this spring for the ninth consecutive year. Newswise — SEASIDE, Ca., March 1, 2018 – California State University, Monterey Bay (CSUMB) is set to host the Startup Challenge again this spring for the ninth consecutive year. The Startup Challenge is a new business competition and accelerator program that supports the founding, funding and growth of new and innovative businesses in the Monterey Bay region. The competition, which as awarded more than $350K over nine years, offers three divisions for competitors based on the size and scope of their business. Venture Division: Open to businesses that are intended to scale and provide venture-investor level returns. Main Street Division: Open to small businesses, sole proprietorships, and nonprofits. Student Division: Open to students in high school, community colleges, colleges and universities. Entrepreneurs and startup companies in Monterey, Santa Cruz and San Benito counties, as well as Gilroy and Morgan Hill, may apply to the competition through CSUMB’s Institution for Innovation and Economic Development (iiED). Applications are due by midnight, Monday, March 12th. Startup Challenge is also offering introduction to Startup Challenge workshops to help prospective contestants prepare their application and business pitch. Key dates for the Challenge are the application deadline on March 12th, the qualifying round pitches on April 8th, and the final round and venture showcase on May 12th. The Startup Challenge Monterey Bay is organized by the Institute for Innovation and Economic Development (iiED). The iiED provides programs and events to support entrepreneurs and entrepreneurship in the Monterey Bay region. The iiED is an institute of the College of Business at CSU Monterey Bay. SEASIDE, Calif. – The role technology plays in agriculture continues to grow. But what about the role women play? On Wednesday a symposium will feature some of the top women in agriculture, technology and agtech. According to Executive Director of the Institute for Innovation and Economic Development, Brad Barbeau, not enough women are entering STEM fields or tech fields, even though that’s what companies and industries are increasingly looking for. Pair that with farming, which is also typically dominated by men, it makes the environment not as welcoming for females. Some of the top women from the biggest Agriculture companies will speak about their experiences in tech, agriculture and agtech Wednesday. “Having successful women talk about what their experiences have been, whats helped them be successful and what are some of the barriers and how do we understand those barriers,” said Barbeau. The panel discussion will be today from 2-6PM at CSUMB University Center, 4314 Sixth Avenue Seaside, CA 93955. Note: This article was originally published by The Lutrinae, please follow the link to read the original. This past Friday through Sunday, Cal State University, Monterey Bay hosted the sixth annual Startup Weekend for the Monterey Bay area. Taking place every January, the event gives young entrepreneurs the chance to learn in an environment that encourages “startup magic,” working together to create startups in one chaotic weekend. Their goal is to help teach through doing, foregoing long panels and textbooks in favor of workshops and collaboration. This is to encourage entrepreneurs to learn through experience, and not just through hypothetical situations. The main event of the weekend is the startup challenge, where teams compete by delivering short presentations to practice pitching their company to investors or in other professional situations. This “Shark Tank”-style environment doesn’t just offer experience for entrepreneurs, but also gives them a chance to win money in both cash prizes and legal or other business services. The teams are split up into three categories: Venture, for startups aiming high and hoping to grow into proper enterprises; Main Street, for small businesses; and Student, for young entrepreneurs somewhere in between highschool and graduate school. Landing in first place this year was the proposed service Swoop, which aims to connect homeowners with people seeking parking for venues. Taking second was Line Jumper, a service that would rock the queue-economy by allowing people to buy, sell, and auction their place in line. Coming in third, but winning the ultimate favour of the crowd, was Furever. Furever would set out to connect homeless pets with willing and able owners, a good idea with a lovely sentiment, leaving no surprise as to why in won crowd favourite.